Yeah, I know, comma splice in the headline. Deal with it. So I’m flipping through the Saturday Night Live Web pages on NBC.com, trying to figure out when the new season starts, but that’s apparently a closely guarded secret. Please, NBC urges me, watch some highly dated topical humor from October 2010 instead. Christine O’Donnell jokes will be eternally funny! err: undefined does sound a little like a British non-lexical vocable speech disfluency, kinda like the machine is saying, “Uh….oops.” However, it’s two bad things in one: an error condition and an undefined error condition. 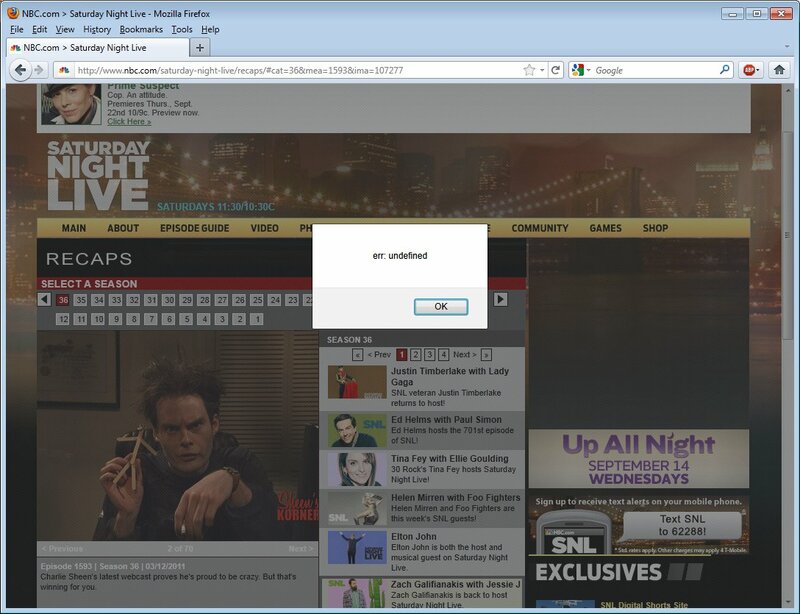 Within a content management system (CMS) environment, which I assume NBC.com uses, they have a way for non-technical people to enter content into a slideshow presentation like this, complete with images and links and whatnot. Some Web sites are built with a base set and expanded or replaced as needed. How to test for them? In the beginning and in smaller starting sites or with content rotators that will not change content, you can simply manually test to ensure the content and images are there and correct. With a larger site that’s going to be out there long term with a bunch of interns mucking around in the CMS, you should try to get some automated testing running through it that clicks through the elements in an individual content rotator and looks not so much for grammar errors or incongruities between the text, image, and links (if any), but instead focuses on making sure that each click brings a complete new slide with image and not an error or missing content. Then, you should schedule that automated test to run regularly, nightly if you can make it, and send you results that will highlight when someone has bollixed it up accidentally. This entry was posted on Tuesday, September 6th, 2011 at 9:15 am by The Director	and is filed under Failed Web sites. You can follow any responses to this entry through the RSS 2.0 feed. Both comments and pings are currently closed.